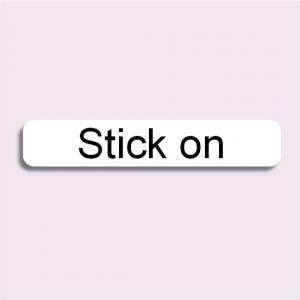 Stick on vinyl name labels are really useful for keeping track of residents possessions including glasses cases, mobile phones, walking aids and all sorts of other personal belongings in care and nursing homes. They are dishwasher and microwave friendly, but please don't use them in shoes, we offer some specially designed shoe labels which are just for this purpose. Our LAUNDER™ Stick On Clothing Labels are designed specifically to be used in clothing. Simply stick, wait to dry and then wash as normal. All our stick on labels ship the same day (orders before 2pm weekdays) with FREE UK delivery as standard. Not found what you want? Why not visit The Name Label Company site if you are looking for children's stick on name labels.